The death toll of suicide attack and firing on worshipers at Imamia mosque at Hayatabad on Friday reaches to 19. Khyber Pakhtunkhwa Secretary Health Mustaq Jadoon talking to journalists at Hayatabad Medical Complex Peshawar, where most of the injured were brought for treatment, confirmed that 19 bodies and 41 injured were brought to the hospital and extensive treatment was being provided to the victims. He said that four patients were shifted to Khyber Teaching Hospital and one to Lady Reading Hospital. The law enforcement agencies cordoned off the area and started search operation for arrest of the third attacker as one of the attacker blasted himself, while the other injured from guard firing expired of wounds, said SSP Operation Dr Mian Saeed. Aerial surveillance of the area through helicopter was underway. IGP Nasir Khan Durrani also rushed to the spot and supervised the operation. Grenade-toting Taliban militants stormed a Shiite mosque in northwest Pakistanwhich led to dozens of wounded and more than 19 killed. 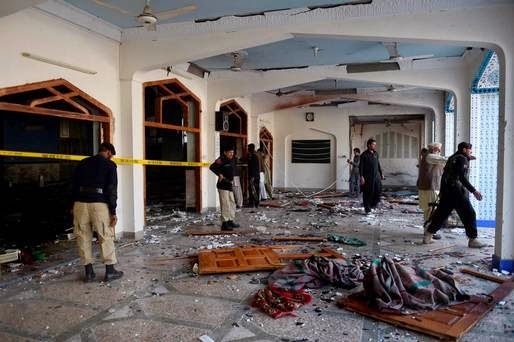 The incident comes two weeks after a suicide bombing at a Shiite mosque in southern Pakistan killed 61 people, the deadliest sectarian incident to hit the country in nearly two years. Police said several gunmen threw grenades before storming the Imamia mosque in Peshawar, the main city in Pakistan's restive northwest, around the time of the main Friday prayers. An AFP reporter saw 18 dead bodies in the Hayatabad Medical Complex, while the hospital's public relations officer Toheed Zulfiqar put the toll at 19, saying one of the dead may have been an attacker. The Tehreek-e-Taliban Pakistan (TTP) claimed responsibility for the attack in an email statement. Senior police official Mian Saeed said the assault, which left more than 60 wounded, began when the militants entered the mosque from a nearby building site. "They were wearing suicide vests and carrying grenades and Kalashnikovs," Saeed told AFP. "One blew himself up while another was shot by police and was later killed. The operation inside the mosque is over but we are conducting a search operation in the surrounding buildings," he said. TV footage showed people running away from the scene, some carrying injured on their shoulders, others limping, as police fired shots and checked people at a barrier. Witness Muhammad Raza told AFP: "There was a huge explosion, I can see many injured lying in front of me." An AFP reporter at the scene saw soldiers and police commandos arriving. The mosque is close to several government buildings including the offices of the Federal Investigation Agency and passport agency. Since June last year the army has been waging a major campaign against strongholds of Taliban and other militants in the North Waziristan tribal area, which lies close to Peshawar. The country has stepped up its fight against militants since a Taliban school massacre in Peshawar in December. Heavily armed gunmen went from room to room at the army-run school gunning down more than 150 people, most of them children, in an attack that horrified the world.